Selling a 2015 Polaris Ranger 570 side by side that has approximately 1300 km. Purchased brand new, very little use. 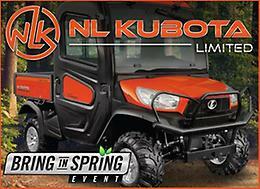 Has power steering, hydraulic dump, 3500lb Polaris wench, cab enclosure, a paint package, and wheel and tire package. Side by side needs nothing, like new. Asking $14,000 OBO. Call or text for fastest reply. -Full DFK weather tight cab system -Heater -Tire and rim upgrade Payments starting as low as $153 B/W tax in! F'N'F BR Deal-a NEW '19 Can-Am Maverick Trail DPS 800 for only $114 Bi-Weekly*! F'N'F BR Deal - Get a NEW '19 Can-Am Defender XT HD8 for only $136 Bi-Weekly*! Selling a 2015 Cfmoto uforce 800 . UTV in great shape , only a little over a 1000 kms on bike . There’s a small tear in the passenger seat otherwise great shape. Bike has a full flip windshield and a winch . Has power steering . There’s a year powertrain warranty left on machine as well . Looking for door nets (both sides) for 2011 Polaris 800 XP. Original part number is 2684652 or 2685119. Please email what you have and how much you want for them. Thanks!